Thursday night I finally got around to using the wonderful baked zucchini I had gotten at the New Berlin Diner on Wednesday. I cooked up some brown rice with a few spices. I really should have used veggie broth, but since I’m going away, I didn’t want it open in the fridge for that long without a chance to use it. After the rice was cooked, I mixed about a cup and a half with the heated up zucchini and topped it with Locatelli cheese. It was one of those comfort meals that I didn’t realize I was craving, but I was. It was very satisfying. Now when I cooked the rice, I have no idea where my brain was…I made twice the amount I needed but it turned into a good thing because I had leftovers. Friday night I was trying to come up with something to eat. I had no veggie burgers left, no beans left. I found a Gardein chicken cutlet in the freezer which I thawed. A regular romaine, tomato, green pepper salad with the chicken cutlet added sounded good. Then I remembered the rice. In my efforts to try to clean out the fridge before I go to Florida, I thought I’d try something. I added garlic powder, ground black pepper and dried basil. I microwaved for a minute or so and added it to my salad. I used the leftover Greek salad dressing also from Wednesday, added some sunflower seeds and of course, Locatelli cheese!! So no photos, but some good news. At Weight Watchers today, I gained half a pound. Actually, it could be a quarter pound, but with their strange method of calculating…I don’t know!! Anyway, I only gained a bit which was great for me. I was a little concerned I wouldn’t be able to hold on to last weeks’ loss but apparently I did! Makes me very happy especially going into another trip. Next week will be WW in Clearwater and continued efforts to stay on track. Tonight we’ll be having dinner with Ele and Little Michael. It’s always so much fun when he’s around. He’s the best little guy. That means there Will be photos tomorrow because you all know how much I love to take His photo! They are just too cute and I love to share them with all of you. 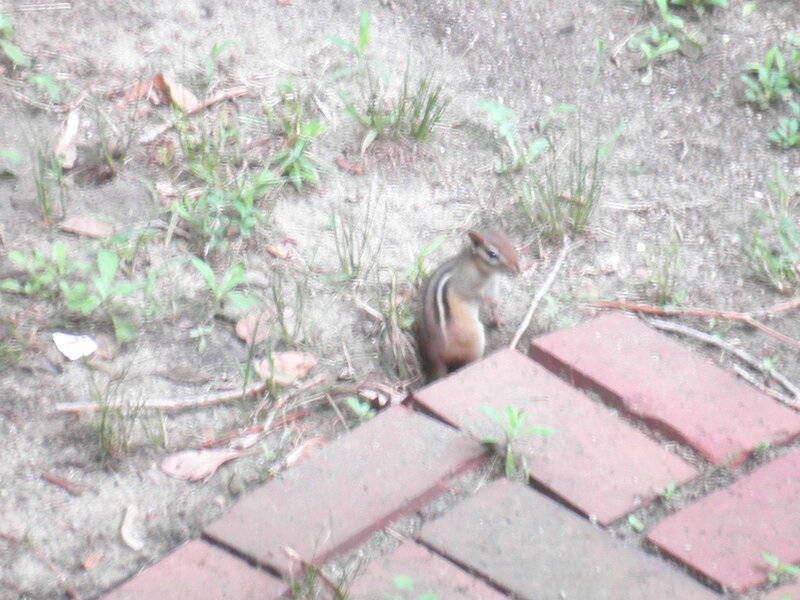 Chipmunks are so cool! Much cooler than squirrels who are – in my formerly urban city-dweller opinion – actually kind of creepy. I like eating cold flavoured rice…I call it salad and don’t even bother with the greens. Ha! I need to take a photo of the little stuffed chipmunk Ralph just got me…too cute!! I never thought about the rice in the salad before, but I think quinoa will be the way to go to get some more protein in! Hope you’re settling in is going well!! I love rice and can eat it day and night. I always make extra and pop in the freezer! It’s a fabulous way to save time. I’m looking forwad to the trip. I’ll keep posting, so you’ll hear all about it. I’ll feel a little guilty though knowing you’re fasting. 😦 Take care! Much to my extreme annoyance, there is no Locatelli cheese in Kansas City. Really like cheese; may have to mail order some. Speaking of zucchini, made a WW online recipe tonight: zucchini, garlic & orange. Yum. That recipe sounds good! Locatelli is the BEST!! It’s expensive and I’m cheap but I still buy it because there’s none better. Here’s their link. http://bestnewyorkfoods.com/locatellicheese-com/index.htm I’ll e-mail it to you, too! Show today? I think yes, I’ll try to be listening! !